Here in North Carolina the weather is FINALLY starting to feel a little like fall. And just in time too, because Halloween is on its way! 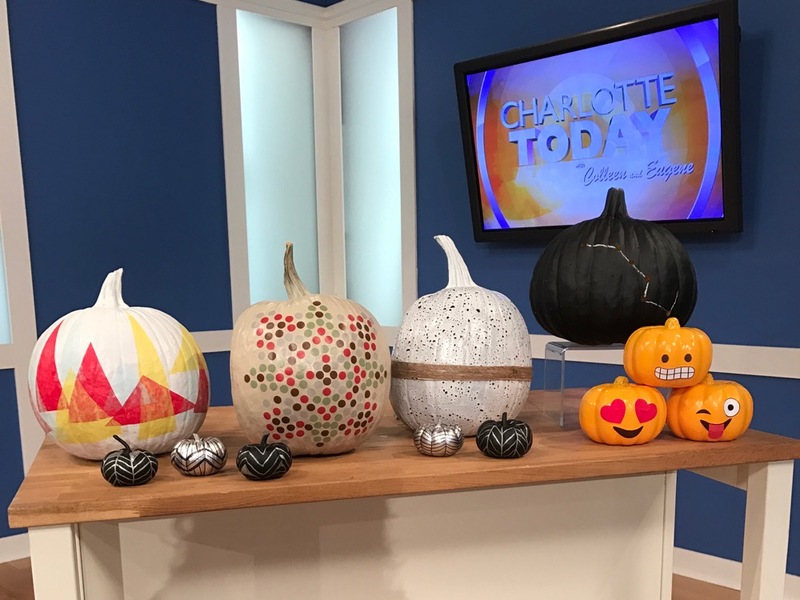 To get ready, I got to join Colleen and Eugene on Charlotte Today and talk about cool ways to decorate pumpkins without carving them. Any of these would be perfect to do with your kids who might be too young to use the knife, or too grossed out by the pumpkin guts to stick with it. Check out the video to see the pumpkins I created. I’ll share some DIY details below. Video not working? Click here. As I explain in the video, I decided to start by spray painting all my pumpkins. This had a dramatic effect right off the bat and was super easy to do. Each pumpkin really only needs a couple of coats because you’re not looking for perfect, long-lasting results. You just need these to look good for a couple of weeks. Have fun with color! Experiment with tape, doilies, stickers, leaves, you name it. The tissue-paper pumpkin was really as easy as I explained. 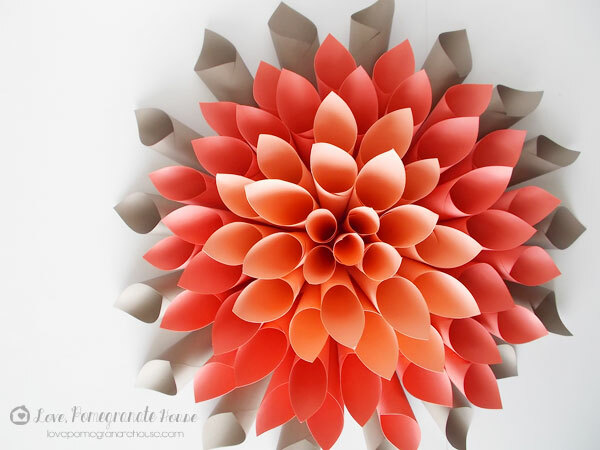 Figure out ahead of time what kind of pattern or design you want to create and cut out all your tissue paper. Once you start Mod-Podging, you don’t want to have to stop and cut more out because your fingers will be all sticky! 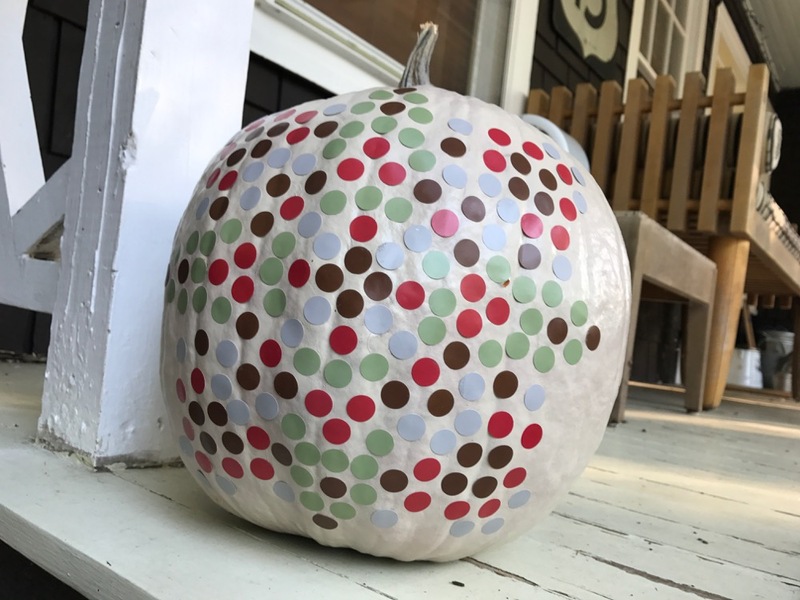 The sticker pumpkin was a lot of fun to create. I order stickers from In Stock Labels. They have thousands of different stickers in different colors, shapes, and sizes. And they offer bulk discounts, which I take advantage of. The great thing about stickers is there’s really no wrong way to do it. This project works for even the youngest kids. As long as they can put a sticker on the pumpkin, they’ll enjoy this project. But it’s fun for adults too. 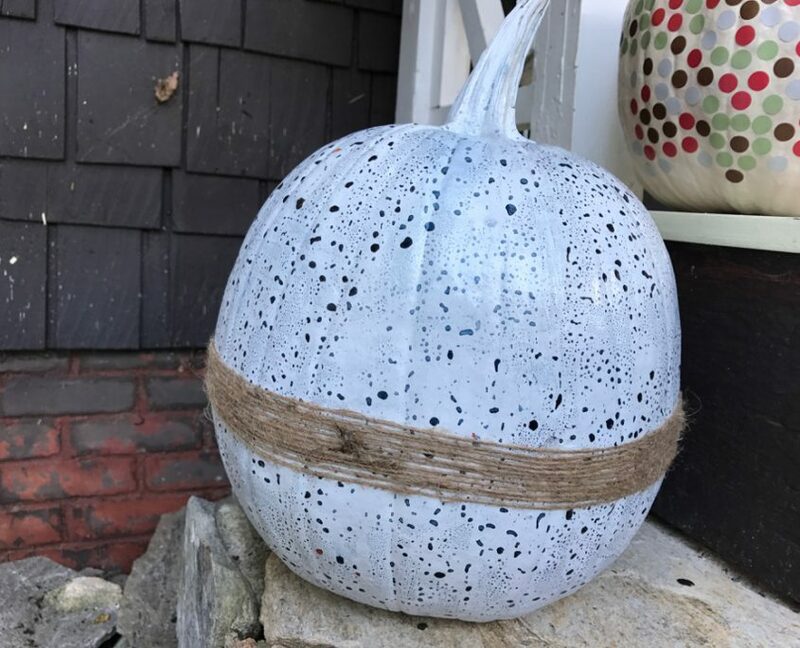 When I talked about the speckled pumpkin in the video, the word I was looking for was pottery or enamel. Not porcelain. Sometimes my brain lags behind my mouth when I’m live on the air. Anyway, when I began this pumpkin I didn’t know how it would turn out. You would probably get lots of different results depending on the type of paint you use for the base coat. I used flat spray paint, but it repelled the watercolor anyway. Still, I loved the result and just left it to dry overnight. As soon as it got a glossy top coat, it looked like something that was made from clay. I would love to experiment more with this method and try different paints for the base coat to see how the results vary. 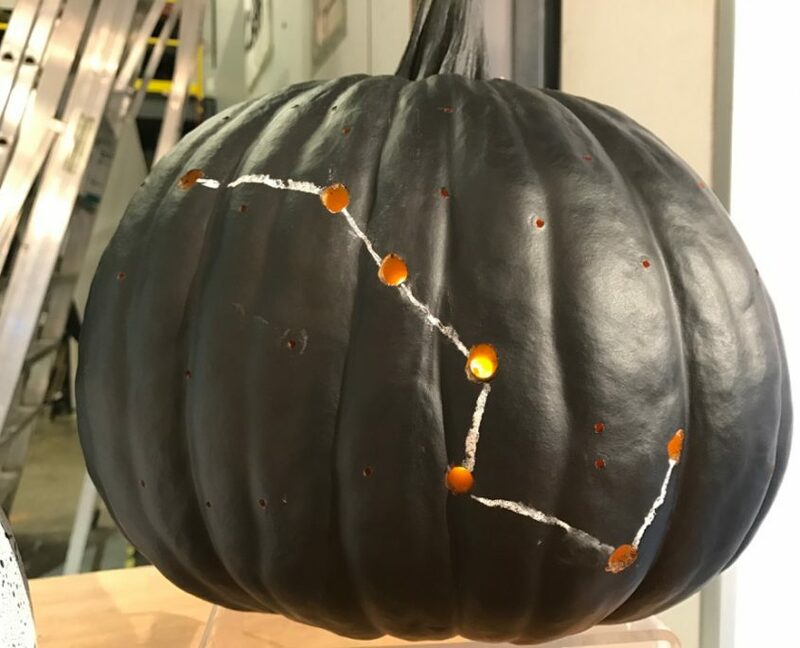 The big dipper pumpkin was super easy considering how amazing it looks. First I cut out the top of the pumpkin and scooped out the seeds and guts. I printed out a simple picture of the big dipper at the right size for my pumpkin face and used that as a template for drilling the big holes. Then I drilled tiny holes all over. After that I cleaned it off and spray painted it black. I would love to see a whole bunch of constellation pumpkins lined up on a wall. I think it would look amazing! 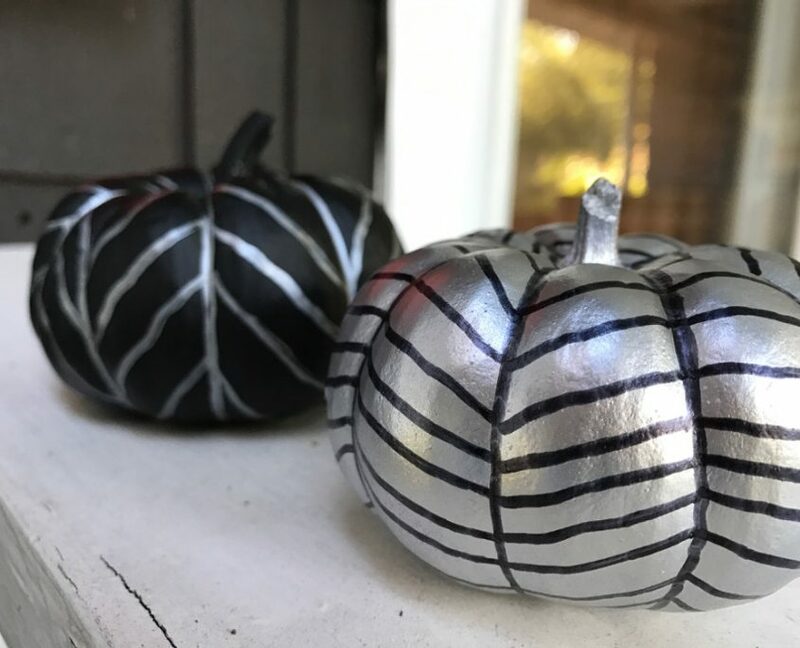 To create the tiny pumpkins, I spray painted some black and some silver. 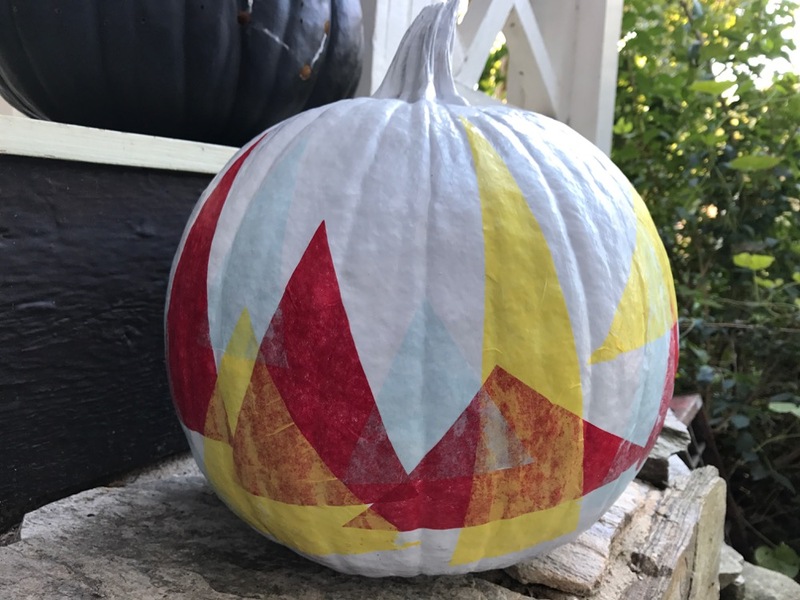 Then using the opposite color Sharpie, I drew lines following the grooves of the pumpkin and then connected them with zig-zags. 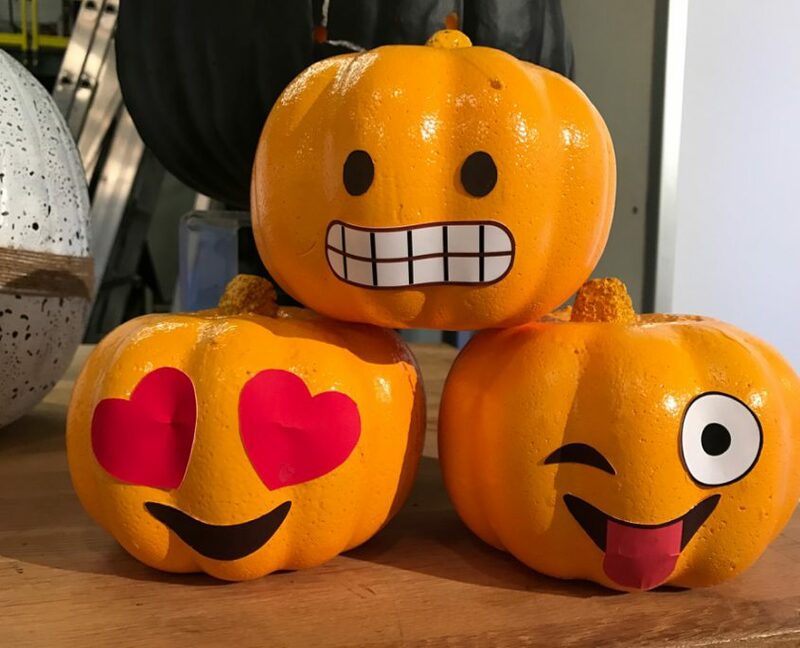 Last but not least, the emoji pumpkins, which we didn’t get to discuss in the segment. I bought 3 foam pumpkins at the dollar store and painted them yellow. Then I printed out enlarged emoji faces and cut them out of paper (I actually tweaked them in Adobe Illustrator, but you don’t have to do that). I glued the faces on using spray mount. They’re so cute, I want to make more! My street gets thousands of trick-or-treaters each year, and we put a lot of effort into decorating our house, so I’m excited to already have my pumpkins created. Now we can focus on the rest of the house! Do you get a lot of trick-or-treaters where you live? If you decided to step away from the screen and create pumpkins (carved or otherwise), I hope you’ll share them with us! Tag them with #stepawayfromthescreen on Instagram, or post them to our Facebook page! Few things symbolize summer more than July Fourth. Everything about the day is celebratory, from parades and swimming pools to hot dogs, watermelon, and fireworks. Summer is also a great time to take on a few simple DIY projects that can make your celebration all the more spectacular. My friends at Charlotte Today asked me to put together a few ideas to share with their viewers and I think I came up with some fun stuff. 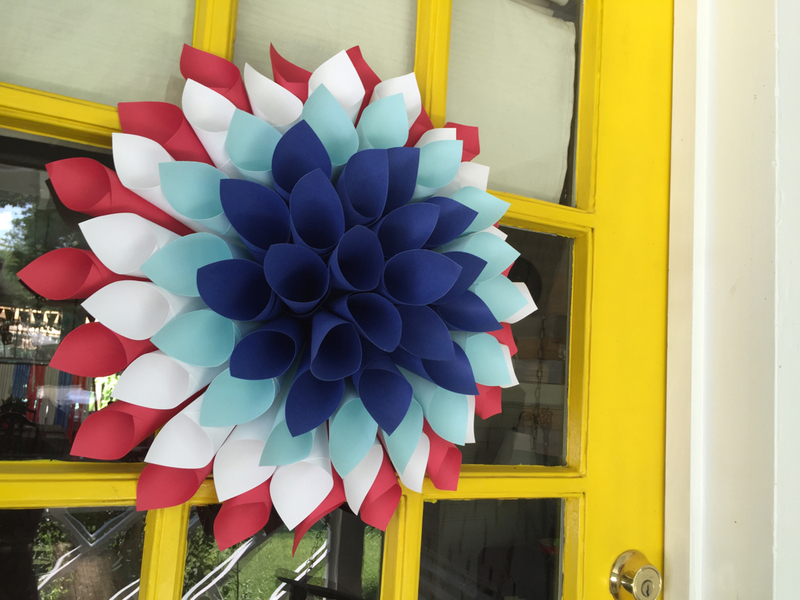 I admit I sought a little help from Pinterest in coming up with some of these ideas, but instead of searching “Fourth of July” I looked at party decorations in general, and just adapted the great ideas for Fourth of July. This yielded much greater variety of search results than the more narrow “Fourth of July” search would have. For example, my wreath was adapted from this gorgeous Paper Dahlia Wreath I found at Love, Pomegranate House. 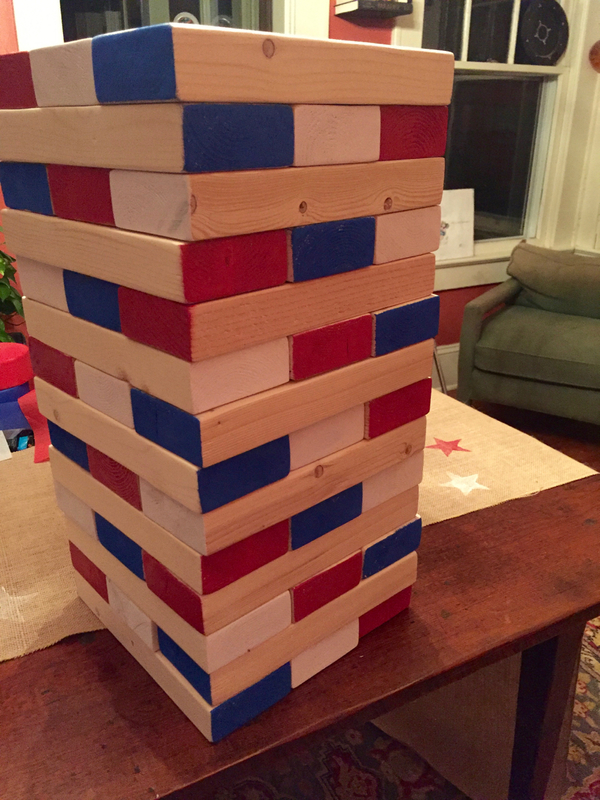 The other idea I found on Pinterest was the giant Jenga set. This is something I know we’ll play with for years to come. And it was so easy to make! I followed the DIY from A Beautiful Mess, and it came out great. All it needed was some red, white, and blue paint and it was ready for July Fourth! And here’s the finished stack. Because my kids are always at sleep away camp during Fourth of July, we don’t usually host a party. But I’m excited to bring this with me to our friends’ party. 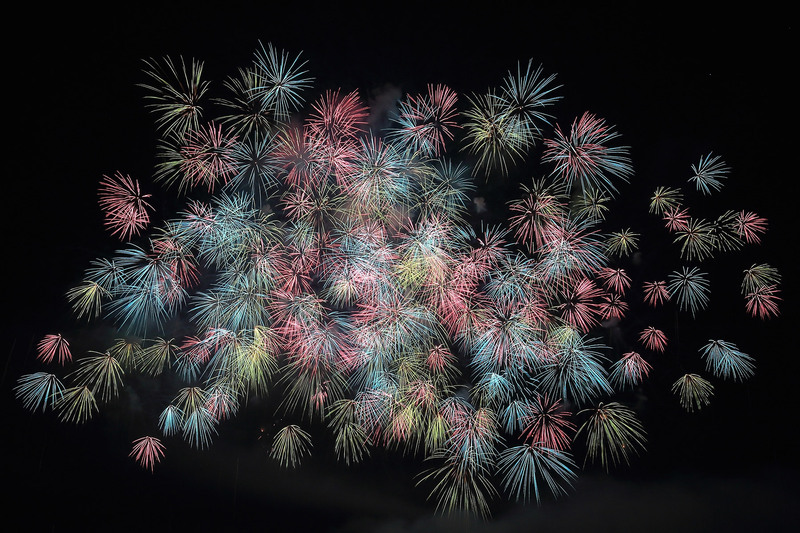 Do you usually have a Fourth of July party? 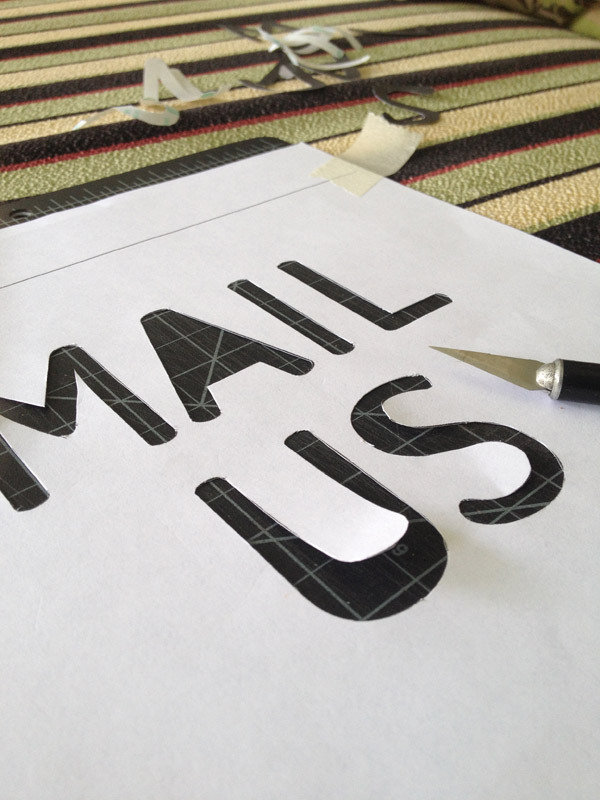 What do you do to add a personal touch? If you step away from the screen and make some of the decorations or games yourself, I hope you’ll share them with us! Tag them with #stepawayfromthescreen on Instagram, or post them to our Facebook page! Are you a parent? Congratulations! This means you have a kid! Which means you probably have TONS of kids artwork. 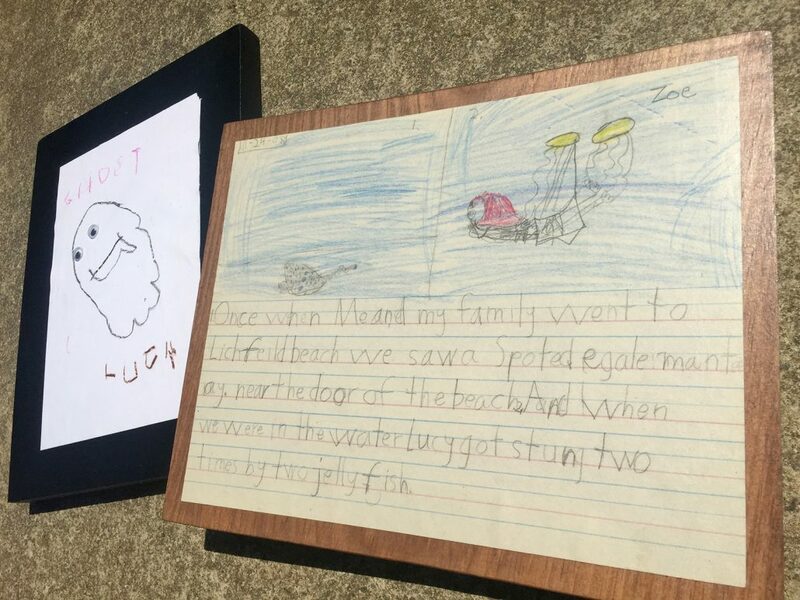 Hundreds — or even thousands — of sheets of paper, covered with colored squiggles, broad, dramatic paint strokes, googly eyes, traced-hands-turkeys, houses with no doors, heads, arms, and legs with no bodies, and story after story after story. You may even have encountered the feeling that you are drowning in paper, literally or metaphorically. Moms and dads, I see you. And I’m here to help. I have twin daughters who love to draw and write, so for each year of school, I had double the number of pages coming home. 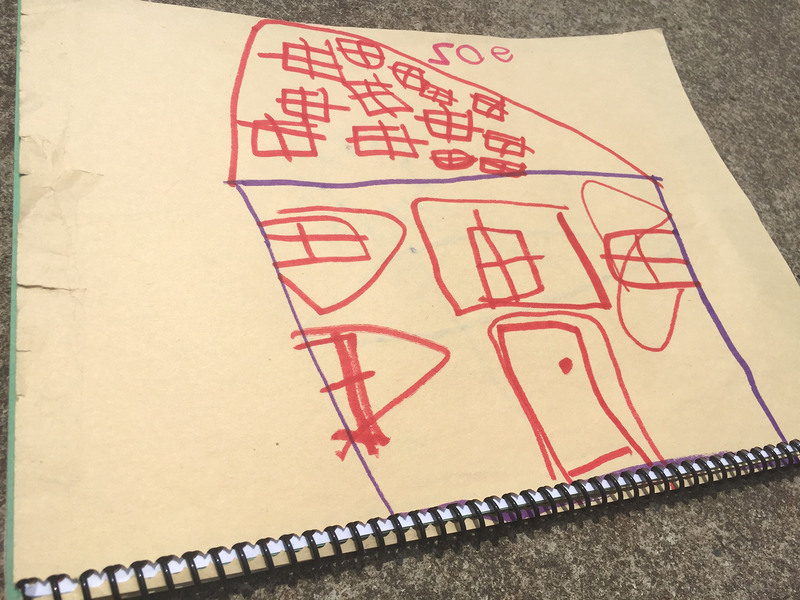 Before we were even done with preschool I knew I had to find a solution to this problem, and pronto, before elementary school began and the artwork would be supplemented with handwriting exercises, arithmetic worksheets, and composition books. And I’m pleased to be able to report, I did find a solution; one that worked amazingly well. My kids are now in the 8th grade and we have exactly ONE box of keepsake artwork for each of them. And each box is only half full. But it’s a nice sampling of the kind of drawing and writing they were doing from age 4 to 14 (so far), as well as programs from performances, ticket stubs from special shows, each year’s holiday card, and a few photos here and there (obviously I have millions of photos stored all over my computer and the cloud — no kid today will ever suffer from too few photos of themselves). On the air I showed 3 basic ways to show your children’s artwork, but while I have your attention, I thought I’d share a few more. 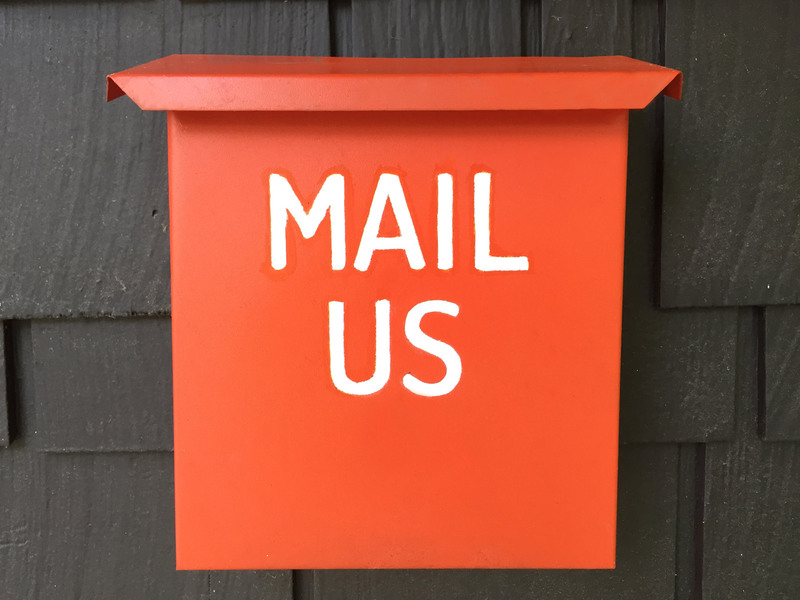 This is an idea you’ve probably seen before, on design blogs or on Pinterest, which shows you what a great idea it is. 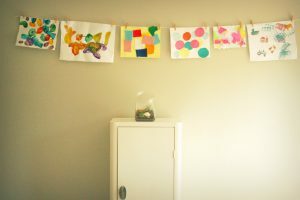 It’s super easy to create, you can hang art of all different sizes, and it’s simple to change the art or just add to the display as new artwork comes in. I borrowed these great images from Nikole from A Happy Nest. She put two screws in the wall, strung a piece of twine between them, and used clothes pins to hang each piece. Regular sized clothes pins work great, or you can find mini clothes pins in craft stores like Michael’s or Jo-Ann. The art will look great clipped to jute, baker’s twine, ribbon, or monofilament. And if you’re not motivated enough to get out the screwdriver, you can even hang the line with thumbtacks. Whatever works for you, it will look great. And your kid will be thrilled. Sometimes your kids bring home a series of pieces where every piece is great, but you don’t necessary want to put the whole series on the wall. Or you may find, when you’re looking back through that box from last year, that you have a bunch of work from the same time period that’s all so great you don’t want to get rid of any of it. Or you may find that you just have a bunch of pieces of the same size. These are all great candidates for a spiral bound book. Any local copy shop (Sir Speedy, Fedex Office, Staples, etc.). can do this for you and let me tell you, it looks fantastic! 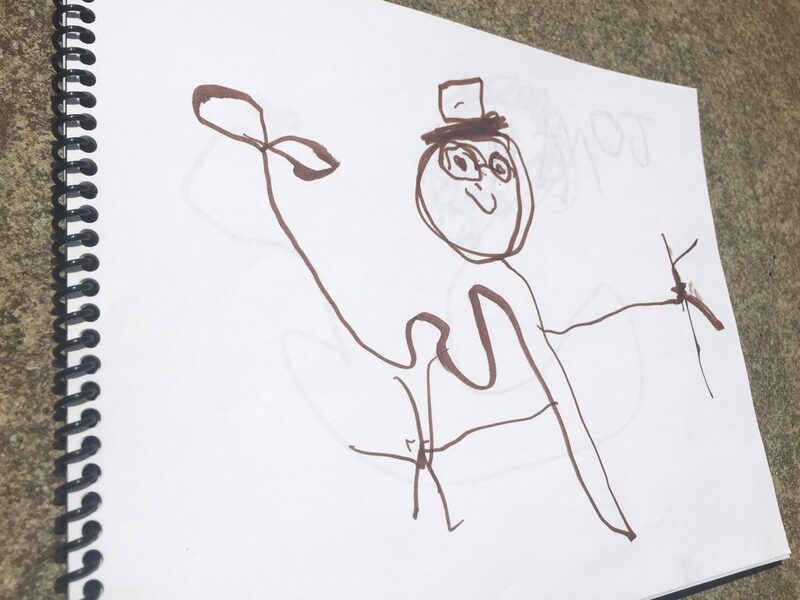 When one of my daughters was in preschool, she drew a picture of every kid in her class. The style was amazing and I loved every one of the drawings. 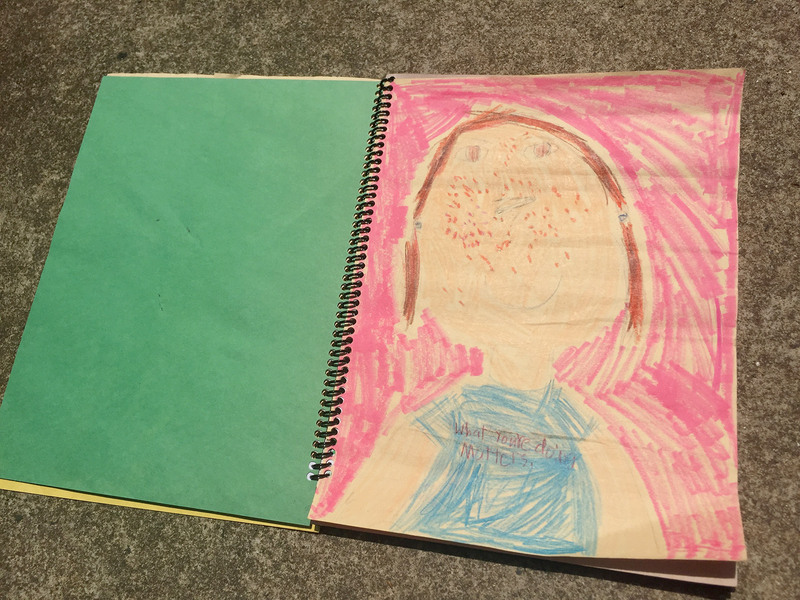 So I made them into a book, with a cover that she designed that says, “My Friends.” We have a few others, and both of my kids love flipping through them and laughing at how “bad” they used to be at drawing. Ha! Chances are, if you have ever used Mod Podge before, you love it. Like Windex in My Big Fat Greek Wedding, there is very little Mod Podge cannot do. 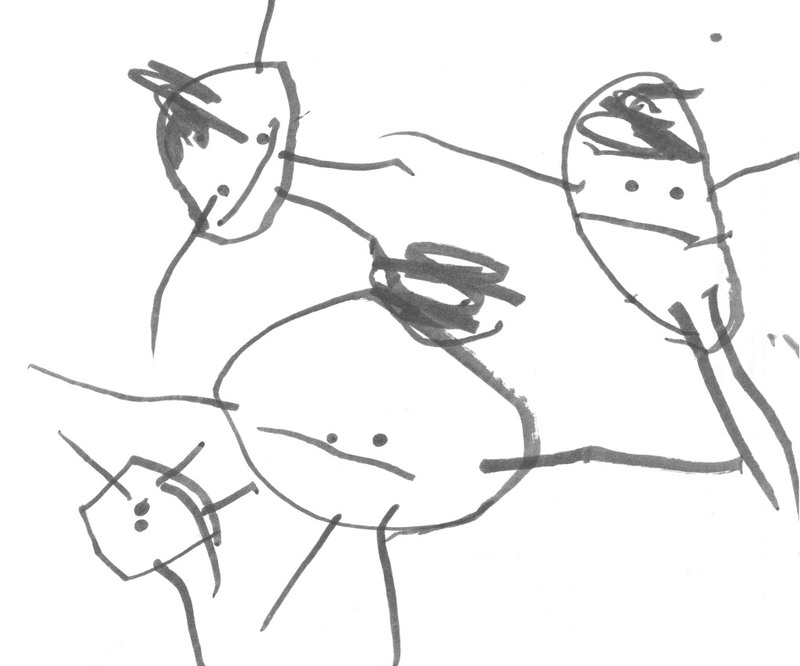 And for preserving your favorite children’s artwork in a truly special way, it has no equal. Especially considering how simple and inexpensive it is. 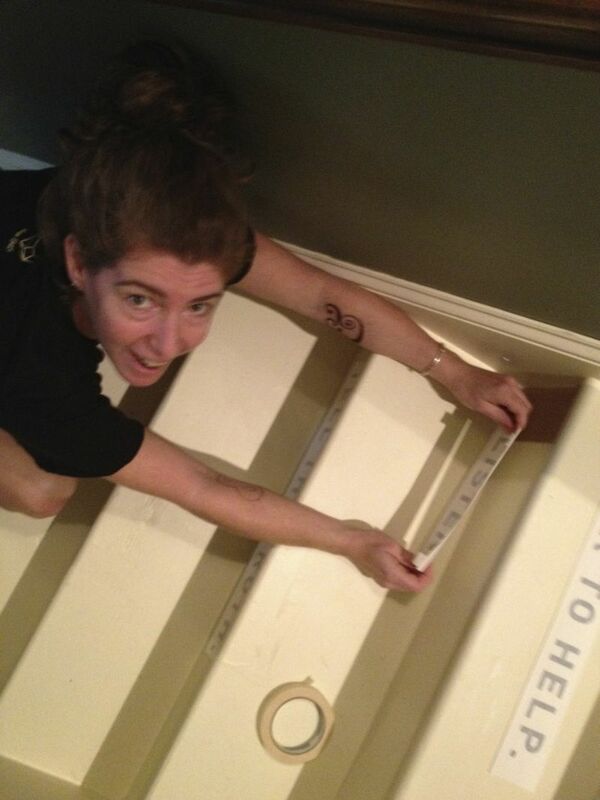 I got an 8ft long 1 x 12 board from Home Depot and asked the lumber guy to cut it for me into 9″ lengths. This gave me ten 9 x 12 pieces that were perfect for mounting 8.5 x 11 paper. I painted and stained the wood to work well with the different art I chose to mount. Then I Mod Podged the artwork onto the board and let it dry completely (if you don’t, the paper may ripple and bubble). Finally, using a sponge brush, I applied a few coats of Mod Podge to the whole board, artwork and all. This seals the art to the board, and gives the whole thing a nice protective finish (I like matte, but they have glossy, satin, and even glitter). The finished boards look amazing arranged in a collage on the wall. And my kids LOVE them, especially as they get older. 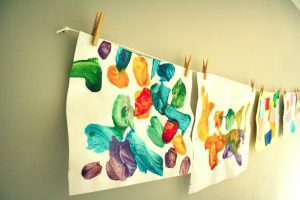 What have you done to manage all your kids’ artwork? Have you come up with some clever ideas for displaying it in your house? I’d love to see! Share with us in the comments, or head over to the Facebook page and post some photos! If you’re an Instagram fan, tag your photos with #stepawayfromthescreen so I can see what you’ve created! 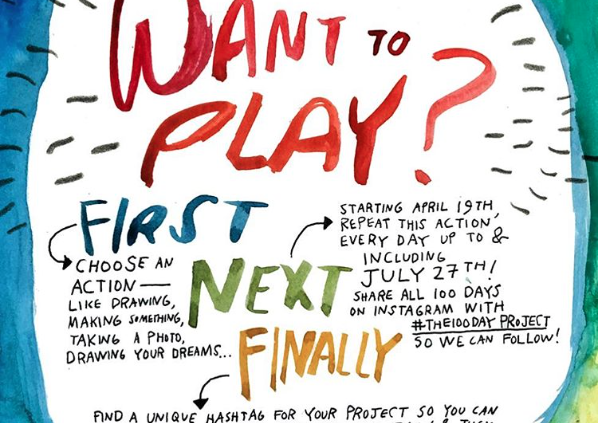 #THE100DAYPROJECT is a free and open project for anyone who is hungry to jump-start their creative practice, who is curious about being a part of a supportive, nurturing community that celebrates the process, and those who are busy busy busy () and searching for a bite-sized way to nurture their creativity! Is this you? If so, you’re in the right spot!  Begin Tuesday, April 19th! When you think of spray painting, you probably think of graffiti, porch furniture, and school spirit boulders. But did you know that pretty much everything can be spray painted? Yes, everything. I have spray painted sneakers, sticks, plastic cat litter bins, vinyl chairs, pillows, cameras, cheap glass vases, lamps, and more. A couple of coats of spray paint can make almost anything look better, even if it looked great before. On the air, I had to be pretty brief, so I thought I’d share some more details here. It’s not like there’s a huge complicated list of things to do before you spray paint; you just need to follow a few basic rules. They don’t add much time to the project, but they do guarantee a perfect paint job. And who doesn’t want a perfect paint job? 1. Prep your surface. Every single time. Sand with 220 grit sandpaper. This is a very fine grain which will just scuff the surface of whatever you’re planning to paint. In the case of wood, it’s enough to smooth out the rough edges and splintery areas; in the case of plastic, it’s enough to scuff the surface enough that it will take the paint better. Wipe with tack cloth. Tack cloth is just cheesecloth that’s been covered in slightly sticky stuff. It removes all the dust you created when you sanded. You can get it at any hardware store, in the paint section, near the sandpaper. Clean with Trisodium Phosphate (TSP). TSP is a fancy name for degreaser; as in it literally dissolves grease and oil. This makes it the best pre-painting cleaner because grease is kryptonite to paint. Also, if you’re painting something that has already been painted, TSP breaks the gloss of oil-based paints and opens the pores of latex-based paint. All this enables your new paint to adhere to the surface. Don’t be afraid of TSP. You can get it at any hardware store. Let it dry completely. Rinse the TSP off your piece (damp sponge, hose it down, rinse in the sink, etc.) and let it dry. Fully dry. Water repels paint, so you don’t want any water on it. At all. None. 2. Shake shake shake. Shake shake shake. Shake shake shake. If you read the instructions on the back of the can it will tell you to shake for 1 minute before painting. Follow this rule. Spray paint contains propellants which must be completely combined before you spray. 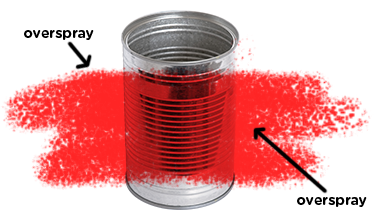 If they aren’t completely combined, they will come out of the can in uneven proportions which means some areas will have more propellant and some will have more paint. What does this mean? It means your paint will clump. And nobody wants clumpy paint. So shake your cans. 3. Multiple light coats are better than a single heavy coat. You should assume that you’ll be applying at least 3 coats to everything you spray paint. I know this may sound like a pain in the neck, but stay with me. Spray paint contains a solvent that evaporates quickly which enables the paint to stick immediately to the surface. If you apply the paint too thickly, the solvent doesn’t have a chance to evaporate and the paint will drip and run Or worse, it will crack as it dries. If you apply the paint with long, fluid, light coats, you will be able to apply another coat in 5 minutes. Yep, you read that right. In 5 minutes your paint will be totally ready for a second coat. Then wait 5 more minutes and you can apply a third coat. That means the whole thing can be painted in a little more than 10 minutes. With no drips or cracks. 4. Spray paint is a fair weather friend. I know I’m starting to repeat myself by talking about all the chemistry involved in spray painting, but it’s just a major factor in how your project turns out. The best temperature for spray painting is between 65° and 85°F (18° – 30°C), and 75°F (24°C) with no humidity is ideal. If it’s too cold your paint won’t dry; too hot and your paint will dry too fast. Just right and your paint will be just right. Be like Goldilocks. 5. Don’t paint in direct, bright sun. This seems very counter-intuitive, but trust me on this one. Direct sun causes the solvents to evaporate before the paint even hits your piece, which results in tiny little clumps all over your paint. It will look like you painted something covered in dust or sand, even though I know you followed my instructions and cleaned the heck out of your piece. Lingering too long in one spot causes the paint to blotch. This will actually create a raised surface on your piece which is very noticeable once the painting is finished. To avoid this, keep the paint can moving constantly (slowly and fluidly), and change directions off your piece. I call this overspray, which refers to the areas around your piece that get sprayed in the process of moving the can back and forth. That’s where you want to change direction — to the right or left of the piece as you spray — to make sure you don’t get unintentional build-up on your piece. 7. Let it dry. Then let it cure. Most spray paint is dry enough to handle in about 6-8 hours. But it still isn’t completely dry. For maximum adhesion and hardness, you need to let the piece cure before you really start using it. This takes between 3-7 days, depending on the weather and how many coats you applied. 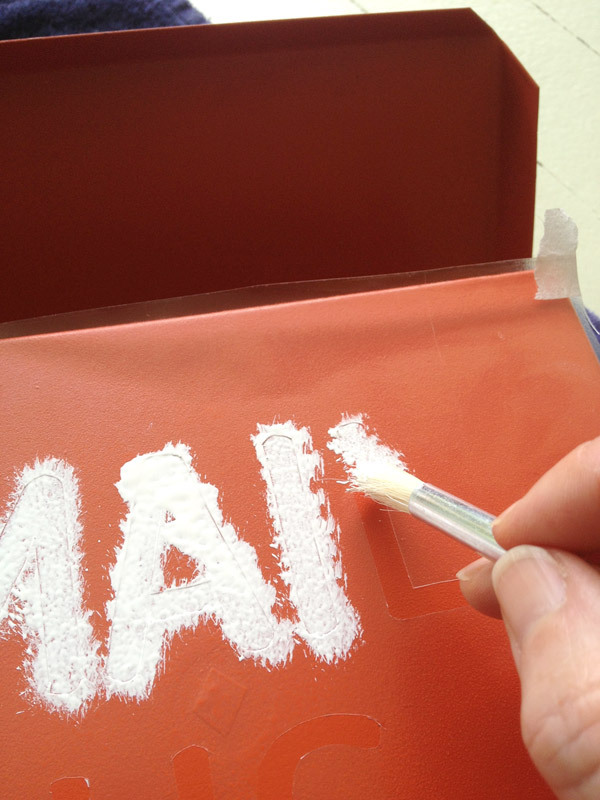 To test if a piece is cured, choose an inconspicuous area and press your fingernail into the paint. If it leaves an indent your paint is not fully cured. If no indent is visible and the surface is hard, your paint has cured. And that’s it! I can’t wait to see what you paint. Please share your creations with me, either with a link in the comments, over on our Facebook Page, or tag your Instagram posts with #stepawayfromthescreen. Hey kids! I thought it might be time for another story about something I stepped away from the screen and made. Yeah? Okay! This story has a few “parts” to it, so I thought I’d break it down into bite size pieces. 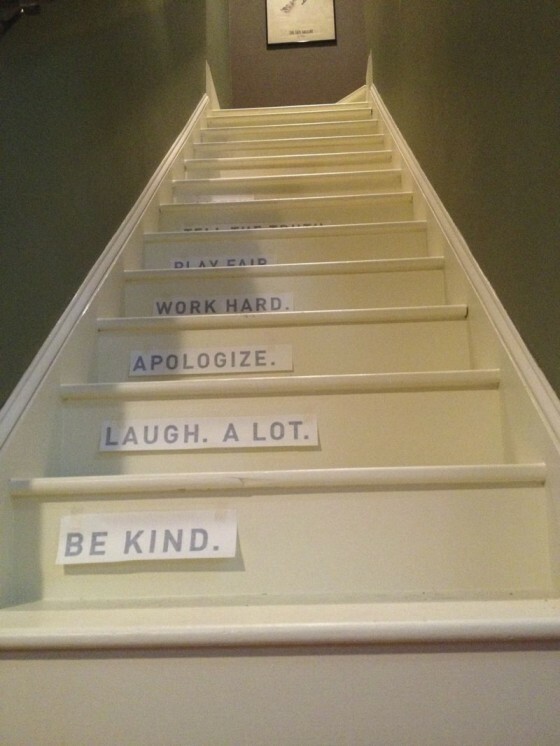 About a year and a half ago, I started writing our family’s “house rules.” I had seen a few of these lists floating around the Internet and really liked what they were all about. Especially in a house with kids. So I started working. Not diligently, but whenever something occurred to me, I would add it to the list. I kept the list on Evernote so it would be with me wherever I was. 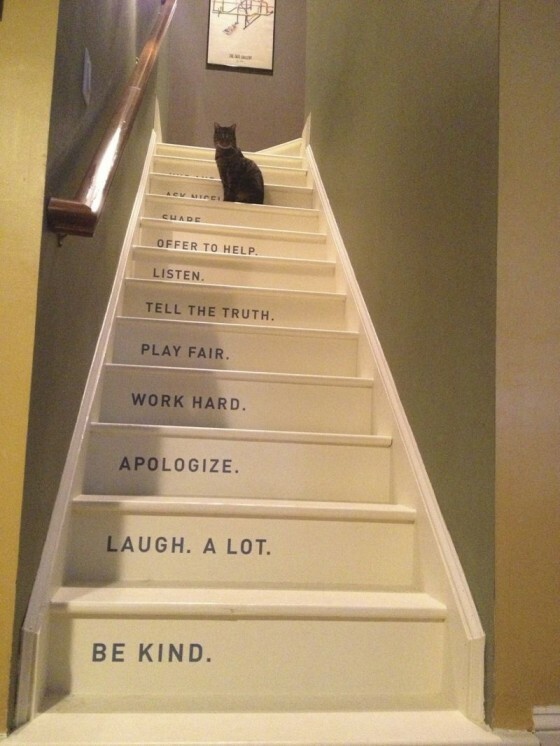 The house rules were coming along nicely, but there was a problem: Where was I going to put it once it was finished? We don’t have a ton of walls in our house (years ago previous owners knocked down most of the walls turning a boxy, compartmentalized, 1930’s era bungalow into an open, airy, modern feeling home. We love it, but we don’t have as many places to hang things as we might like. ), and most of those walls were already exhibiting art, as we’d lived in the house for 6 years. One daydreamy afternoon, I’m thinking about our stairs, and what fun thing I could create for them, when suddenly it all comes together for me. 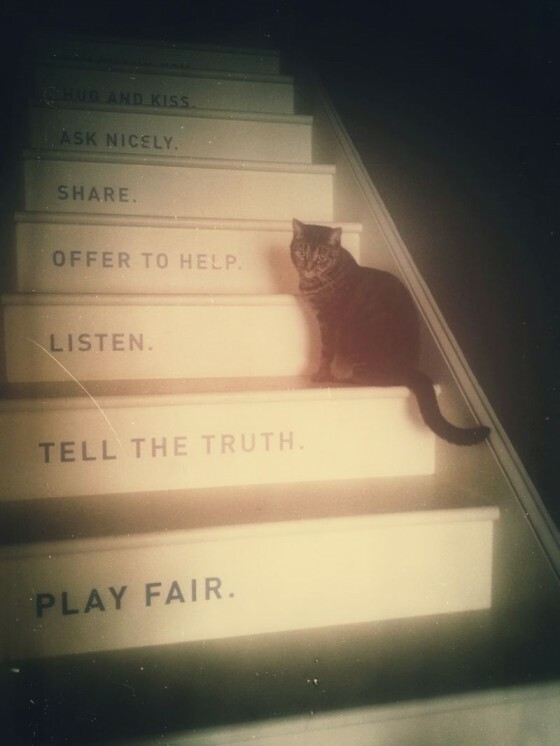 The house rules! 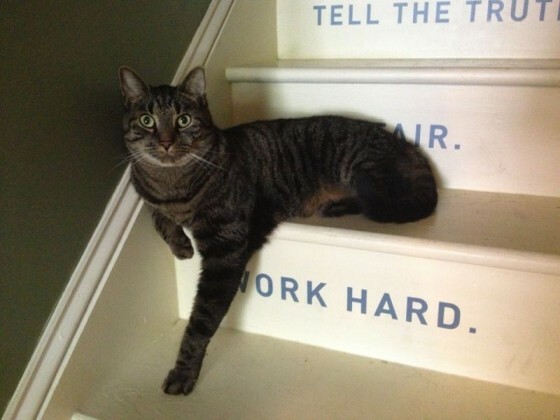 On the stairs! One rule per step. I counted the steps (13) and opened the house rules document. I had 9 rules. Surely I could come up with 4 more. 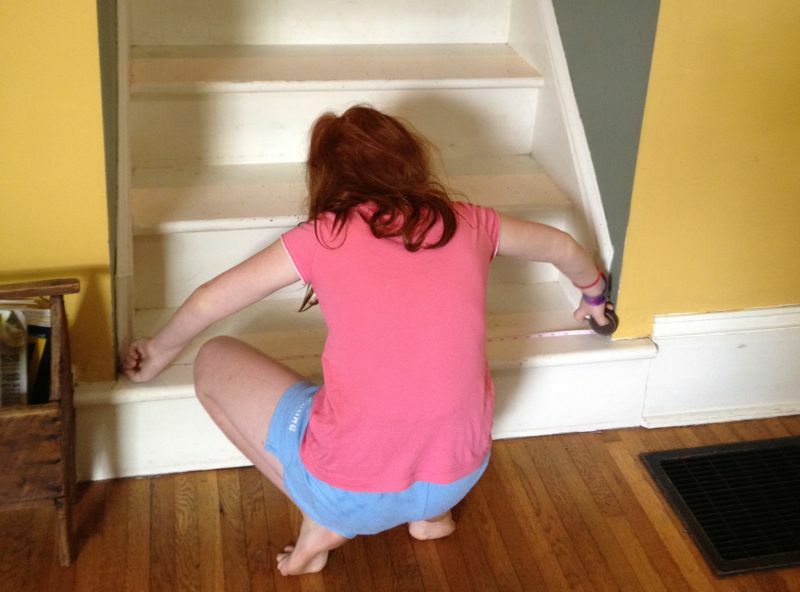 The stairs were, upon close inspection, pretty banged up. 6 years of a family of 4 on white stairs? Yeah. Might need a little paint. So that was the first part of the project. 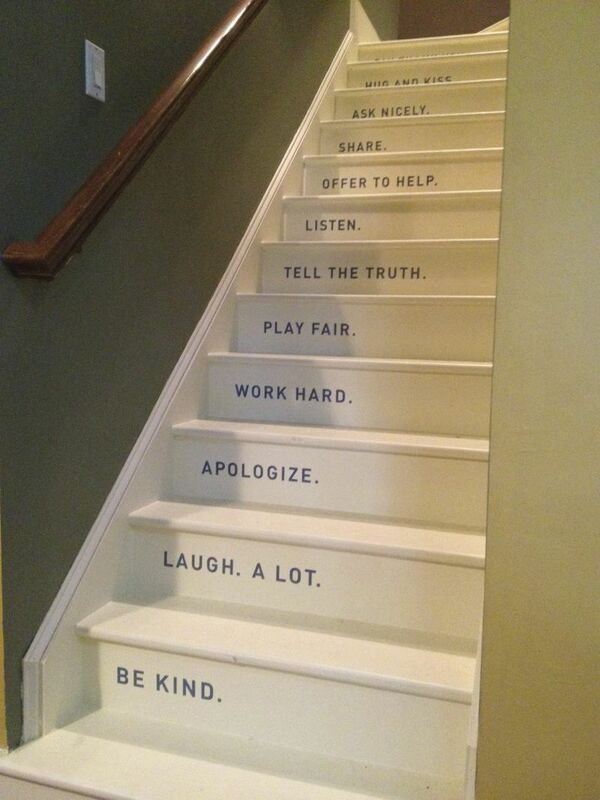 meanwhile, I was trying to figure out the best way to get the words on the stairs. I considered freehand painting, sharpie, and stencil painting, but I’m a fairly compulsive person (understatement), and I know that any imperfections would drive me crazy. Finally I decided on vinyl. Choosing the typeface and, more importantly, the color took a while — the stairs are surrounded by yellow, sage green, red, and brown walls. What color would work with all of those? We ultimately decided on a steely blue grey. And practical, clean DIN for the font. I designed the words and had them printed at my favorite sign company for about $40. Got the vinyl back as one big sheet. While I cut the lines apart, I also stressed about how to apply them so they’d be straight and also spaced the same distance from the wall (remember — compulsive). I decided left-aligned would work better than centered, and would also look more modern. It’s time for another Step Away project! This time I took on the mailbox. 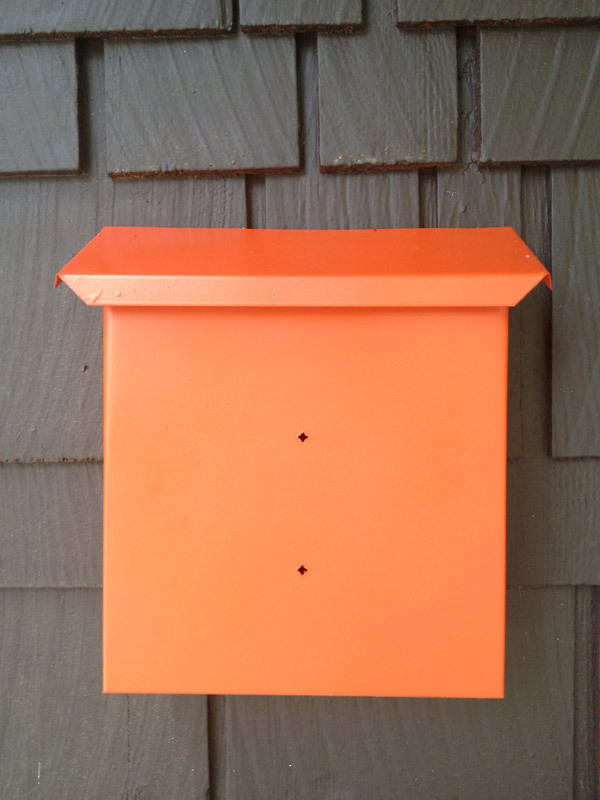 When we moved into our house 7 years ago, we inherited a plain, black mailbox mounted on the wall of the front porch. It wasn’t interesting, but it also wasn’t offensive. So it stayed, but with the plan that someday I wanted to make it better. Now that I’m in the middle of my Step Away challenge, I decided the mailbox’s time had come. First thing I did was paint it. (So quickly that I didn’t even get a picture of the previously black mailbox. Oops.) We have a dark brown house with white trim, yellow window boxes, and a yellow door. Orange seemed to be the perfect counterpoint to all those colors and a few coats of spray paint made it so. I wanted it to have a little more to it, though. And I’ve always loved vintage mailboxes that say “POST” or “LETTERS”, so I started gathering pictures. But I couldn’t help but feel like the whole “vintage mailbox” thing has been played out. So I was also trying hard to figure out something else I could do. And voila! 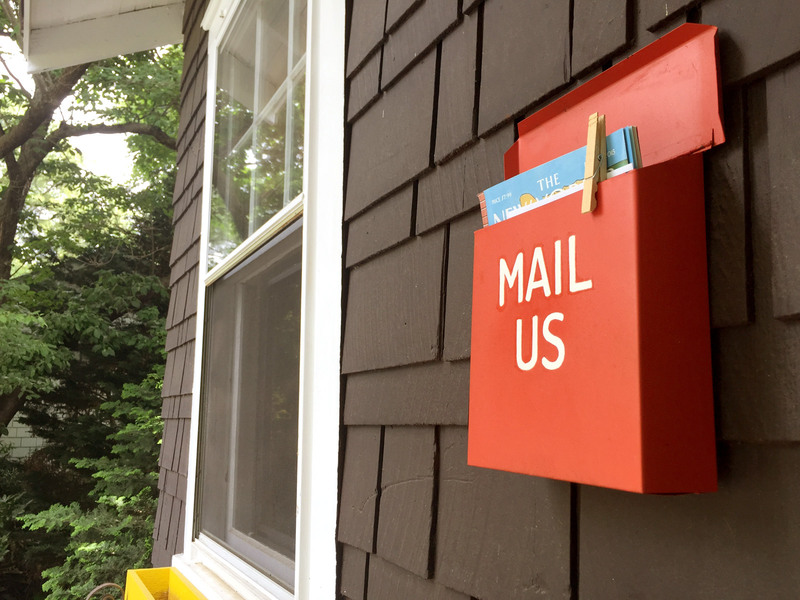 Our new mailbox!